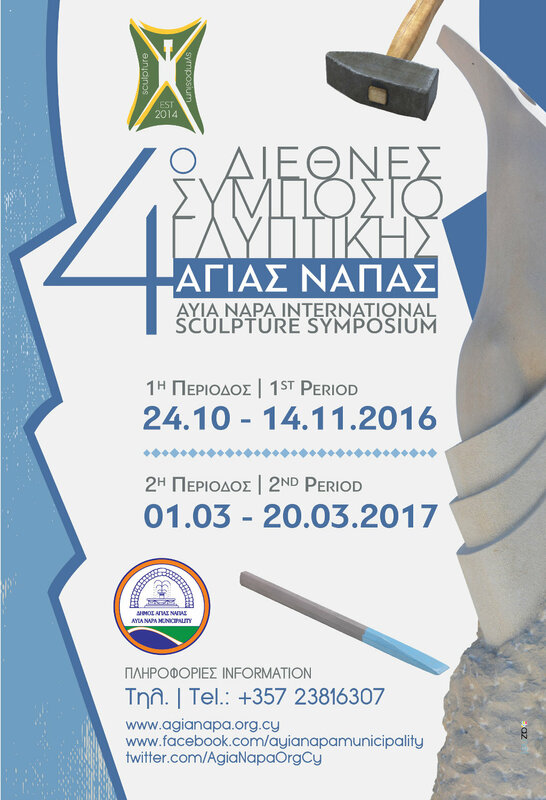 Ayia Napa Municipality organises the 4th Symposium of Sculpture 2016-2017. A. The institutionalization of the event after the great success of the 1st Sculpture Symposium 2013-2014, the 2 nd Sculpture Symposium 2014-2015 and the 3 rd Sculpture Symposium 2015-2016 and the establishment of Ayia Napa Sculpture Park as a work of Pan-European Scope. B. The enrichment of the Park by creating new Sculpture Works from different artists around the world and its establishment as a unique attraction of interest. D. The contact and acquaintance of the thousands of Ayia Napa visitors with the art of Sculpture. E. The improvement and enrichment of cultural events during the Symposium. 1. The 4th Symposium will take place in two time periods 24/10/2016 - 14/11/2016, 01/03/2017 - 20/03/2017. During the Symposium’s period there will be a group participation of more than 8 artists in creating sculpture works. During the ten last days of the second period, other artistic events with the primary theme: "the Cypriot Aphrodite of Cape Greco" will be taking place such as Music Concerts, Fine Art Exhibitions, Literary Presentation Events, the awards of participating artists etc. e-mail address: mariacultural@agianapa.org.cy, tel. 00357- 23816307. 2. To determine the period that he/she wishes to participate and this must not exceed the three weeks of the two time periods mentioned above. Each artist will be working in the Sculpture Park from 9: 00 -18: 00. 3. Every artist must send his/her CV as also endorse the terms of the symposium and send them back. 4. To submit photographs of at least four of his/her works, his/her photographs and his/her passport copy. 5. Every artist should beforehand determine to us the kind of material to be used for his/her work and the dimensions of the project along with a drawing or a photo of the model. 6. Dimensions of the stone to be used - height X width X depth. 7. To determine the dimensions of the stone base to be used - height X width X depth. 8. In case that the project is approved by the Symposium committee the artist must sent the proposal model of the project made from clay or other material. 1. Each artist has free accommodation and full board for a period of three weeks in Ayia Napa hotels. 2. Will provide free the materials of the artist’s creation and the tools and equipment except from the small personal tools which the artist must bring along. 3. An Entry Visa Invitation for artists from third countries. 4. The booking and ticket payment will be done by the Artist and Ayia Napa Municipality will reimburse the artist for the corresponding amount on his arrival in Ayia Napa. 5. An Artist’s Gratuity of a thousand euro (€1,000) will be offered to every artist, after the completion of the project. 6. The Artist’s work theme will be will be determined in consultation with the Cultural Officer at Ayia Napa Municipality, Mrs Maria Tofini Tsantila, (e-mail address: mariacultural@agianapa.org.cy, tel. 00357- 23816307), and the size of the project must be at least 2.50 meters. 7. The main material that Cyprus has for Sculpture works is the Cyprus Limestone of Kivides or marble (if set). 8. The works of all artists will be placed at the Sculpture Park or in another place of Ayia Napa Municipality and always according to the discretion of the committee and will constitute the property of Ayia Napa Municipality. 9. Each artist prior his arrival must send the title and a description of the project up to 50 words. 10. At the end of the Symposium, Ayia Napa Municipality will honour all artists by awarding commemorative diplomas.